There was a large and consistent difference in the use of center-based care and education by family income across this time period. Among children under age five, 27 percent of children with a family income below 200 percent of the Federal Poverty Level (FPL) participated in center-based care compared to 40 percent of their peers with family incomes above 200 percent of the FPL (in 2005). One way of understanding the magnitude of this income gap is that at each age between birth and age four, a child from a higher-income family (above 200 percent of the FPL) was as likely to be in center-based care as a child one year older from a low-income family (below 200 percent of the FPL). 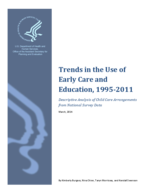 For example, a higher-income two-year-old was just as likely as a low-income three-year-old to be in center-based care. Not surprisingly, lower-income children (below 200 percent of the FPL) were more likely to be in publicly-funded centers without a family payment, and less likely to be in private preschool or centers with a family payment, compared to their relatively higher-income peers. From 1995 to 2011 public preschool enrollment increased for children in families with incomes both above and below 200 percent of the FPL. However, for low-income children, this resulted in a net growth in preschool enrollment, whereas for higher-income children there was an observed substitution from private preschools into public alternatives.